A brief history of the start and early development of ultrasonography in China, as provided to the author by Professor Xin-Fang Wang. Ultrasound diagnosis has in fact started fairly early in China compared with many other countries. Between 1964 and 1974 the Cultural Revolution had brought turmoil to the country which not only completely stopped ultrasonic development for10 years but also made the country poor enough to embark on any large scale development that follows. Ultrasound diagnosis started in Shanghai in 1958 with the establishment of the Shanghai Ultrasonic Medical Research Group ( ) at the Sixth People's Hospital of Shanghai. The group was led by Shih An ( ) in collaboration with researchers from the Shanghai First and Second Medical Colleges. They used a Chiang Nan Type 1 ( ) metal flaw detector with a frequency of 2.5 megahertz. (pictured on left). The first National Ultrasound Conference was held in Wuhan ( ) in July 1959, where the usefulness of ultrasonics was bought to the attention of the medical community. In their first papers in 1960 and 1962 (mentioned above and linked below), A-scope patterns of diseases of the liver, stomach, cervical cancer, breast tumors, normal pregnancies and hydatidiform moles were pictorially and impressively presented. This was a seminal paper as far as hydatidiform mole was concerned as this has not been formaly reported in the literature. In July 1961 the first book on ultrasound "ultrasonic diagnosis" ( ) was published in China. The contents included basic physics, equipment and A-mode operations only. 2500 copies were printed and circulated. 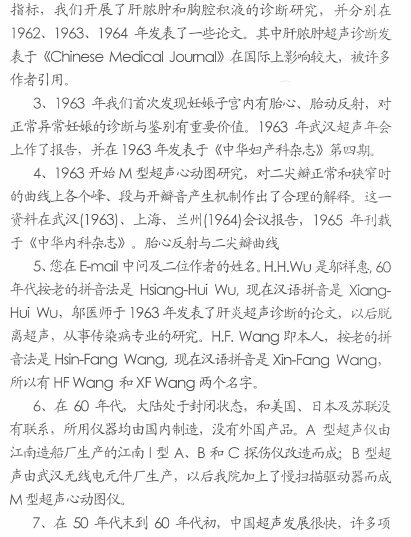 Also in 1962 Xiang-Hui Wu ( ), Wang-Xue Guo ( ) and others published on A-mode findings in hepatitis, cirrhosis and hepatocellular carcinoma. By 1964, a number of other reports have appeared in the Chinese literature. 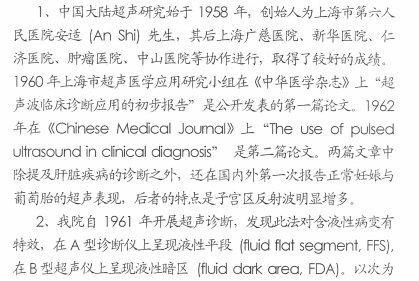 The papers in 1963 by Yong-Chang Chou ( ) and Xin-Fang Wang ( ) (separately) on A and M-mode study of fetal cardiac pulsations were seminal papers in the field and had preceeded Fred Winsberg's paper by 3 years. In 1964, Xin-Fang Wang also pioneered prototype echocardiographic equipments synchronized to electrocardiographic and phonocardiographic signals. In the same year his group published important works which clarified mechanisms of various valvular echo patterns. The earliest B-mode scanner was built in 1960 at the Zhong Shan Hospital, Shanghai Medical University ( ). 200 cases of pathologies including liver tumors, ovarian cysts, uterine fibroids, molar pregnancies, aortic anerysms etc. were subsequently reported. Similar studies were carried out at Beijing and Wuhan at about the same time. These were reported in the National Conferences in 1961 and 1962. Production of B-mode scanners were carried out at an Aerial and Radar supplies factory in Wuhan. 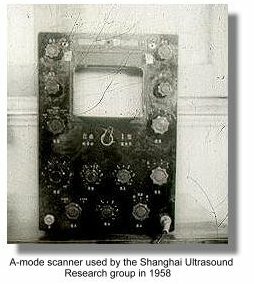 Doppler ultrasound was also in use as early as 1961 in Shanghai. In that year Yian Xian ( ) at the Third People's Hospital in Shanghai had started to use continuous wave doppler to study cardac valves. In 1962, Zhi-Zhang Xu ( ) at the Zhong Shan Hospital ( ) reported doppler findings in arteritis, phebitis, aneurysm and stenosis. Xu also reported in the same year M-mode diagnosis of mitral valvular stenosis. By 1966, doppler investigations were extended to pregnancy in the study of fetal cardiac pulsations and in 1970, continuous fetal heart monitoring in labor. Pulsed-doppler on the other hand came after the 10 year break and only appeared in 1982 where Li Zhang ( ) first reported its use in cardiology. The investigations into real-time equipments had also started as early as 1974 at the Central Military Hospital in Beijing ( ) where a prototype mechanical apparatus was fabricated. In the next year they produced the first 20 crystals linear-array in China which was used to study pregnancy and the female pelvis. By 1979 the group produced a mechanical sector scanner and in 1980 a phased-array sector scanner for cardiac investigations. In the last National conference in 1964 before the onset of the Culural Revolution, 117 degates attended and there were 108 papers read. Only in 1974 (a lapse of the 10 years), that another book on medical ultrasound "Ultrasonic Diagnosis" ( ) was written. It was printed by the Central Military Hospital in Beijing ( ) and 10,000 copies were in circulation. The book contained information of A-, B- M- mode, Doppler and an introduction on real-time ultrasound. The National Ultrasound Conference resumed in September 1975 and was held in Harbin. There were 37 delegates and 41 papers read. Many had realised the standard of technology was low as the world had been moving ahead with great rapidity in the losed years. The National UltrasoundTechnology Information Liason Group ( ) was formed. In December 1976, the the group organised a national Seminar on ultrasound diagnosis and was attended by 200 delegates and 250 papers were read. The Chinese Association of Ultrasound Research ( ) was formed in 1984 by 88 Chinese ultrasound luminaries. Wang-Xue Guo ( ) was the first president. The official publication "Journal of the Chinese Association of Ultrasound in Medicine and Engineering" ( ) was inaugurated in 1985. The association changed its name to the "Chinese Association of Ultrasound in Medicine and Engineering" ( ) in 1986. The association now has 12,000 members. The Chinese Medical Association also hosts a smaller "Society of Ultrasound in Medicine" ( ). Ultrasound diagnosis further developed in China but it was not until the early 1990s that the country began to catch up with world standards, research and developments. In 1988, Xin-Fang Wang ( ), Yong-Chang Chou ( ), Wang-Xue Guo ( ), Zhi-Zhang Xu ( ) and physicist Ruo Feng ( ) were presented with the "History of Medical Ultrasound Pioneer Award" by the World Federation of Ultrasound in Medicine and Biology (WFUMB). The ceremony was held in Washington DC in the United States. Front of the preliminary report published in 1960. Front of the article "The use of pulsed ultrasound in clinical diagnosis" published in 1962.